Every project needs a little TLC: Texture, Life, and Craftsmanship. 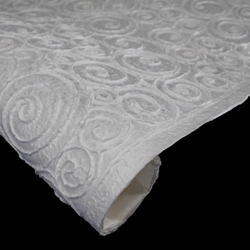 Give your art or home décor project the perfect touch of TLC with the Heavyweight Embossed Mulberry Paper! Every project needs a little TLC: Texture, Life, and Craftsmanship. Give your art or home décor project the perfect touch of TLC with the Heavyweight Embossed Mulberry Paper! Handmade in Thailand, this heavyweight kozo paper features deep embossed spiral designs in soft mulberry for a heavily textured paper perfect for lampshades, notecards, framing, and more! The Thai Heavy Embossed mulberry paper features natural deckled edges on the 22” x 30” size and crisp-cut edges on the 8.5” x 11” size.